Hope they’re right about not affecting overall audience. I read the details provided, but it’s all theoretical. We will measure this through our in house polls with great interest. I emailed CFPL-FM a few years back regarding reception and they said their average power is 179 kW, and only very rarely goes to 300 kW….are you measuring by average, or peak power? are you measuring by average, or peak power? 300kW is CFPL-FM’s peak ERP. Its average is 150kW. I am sure CKOI’s new transmitting antenna on Mt. Royal will produce a much better signal for most listeners, for a variety of reasons. Second, it will have more energy will be angled down toward urban and suburban populations, while losing no range toward the edges of the station’s coverage area, and gaining some from the greater height and sight advantage atop Mt. Royal. Third, Mt. Royal will also cease casting a shadow in CKOI’s coverage to the west. The listed powers of FM stations in North America are “effective radiated power” (or ERP), which is power measured toward the horizon. Super-high-power stations such as CKOI obtain that power by feeding the signal into a stack of antenna bays, which together concentrate their great energy toward the horizon. More bays, more concentration, and a narrower signal in the vertical plane. (This also allows stations to have transmitter power output much lower than the listed ERP. CKOI has fifteen bays. (Far as I know, this is a record.) This means the beam is a very narrow one, with energy dropping off rapidly below the horizon. (A lighthouse beam works the same way.) The antenna bays are also a very old horizontal-only V-bay design. If you look up at them, you’ll see that the wide ends of the antenna’s Vs are pointed away from Mt. Royal. That’s because, even though the V-bay design is meant to be equally strong in all directions, in practice it tends to be weakest toward the back. And, since Mt. Royal is already in the way, why bother with full power in that direction? See, while the wavelengths of AM signals are up to hundreds of meters long, allowing them to pour over mountains, FM waves are about a meter long. This means the coverage tends to be “line of sight.” While FM waves are much longer than those of light, the point is an important one. Height actually matters more than power on FM, and no power can undo the damage caused by “terrain shadowing.” A terrain-shadowed signal can still sound like crap, even if the signal itself is strong. So I’m sure CKOI’s owners have wanted to move up to Mt. Royal for a long time. I also suspect that the CRTC required that CKOI retain its old antenna design to make sure the signal was less than full power down toward the streets of the city. I can’t think of another reason why the owners would not have replaced the system with one using fewer bays (and circular polarization as well). Except, of course, if the plan all along has been to move up to Mt. Royal. Now, as we read above, the vacation of a suitable location by a TV transmitting antenna makes that possible. As we also see from the maps above, there is some gain in range toward the southeast. Still, there will be some loss in the deep fringe. Here’s an example: WRAL/101.5 in Raleigh, North Carolina. Many decades ago, WRAL was the home of the regional Tobacco Network, which carried North Carolina news on many stations, all picking up WRAL’s 250kw signal from Raleigh. The station also bragged in its slogan that the signal reached “from Hatteras to Hickory”: about a 560km span. And it did. That antenna, like CKOI’s, was a many bay (I think 12) design, at 990 feet above average terrain (that’s how the regulations reckon height). WRAL’s sister TV station was putting up a 610-meter tower (the legal max) at the same location. So WRAL gave up its grandfathered status and went up near the top of the new tower with a 100kw (the legal max) signal coming from fewer bays, and “beam tilted” toward the populations below, meaning its ERP toward the horizon was 97kw. Its ratings went way up, as did its signal everywhere but the deepest fringe. Meaning the slogan no longer applied. (By the way, WRAL’s tower came down in a storm, and so many FMs are now crowded on the replacement that WRAL is lower on the new tower than it had been on the old one. Coverage today isn’t the same as it was.) Anyway, I expect similar results for CKOI. 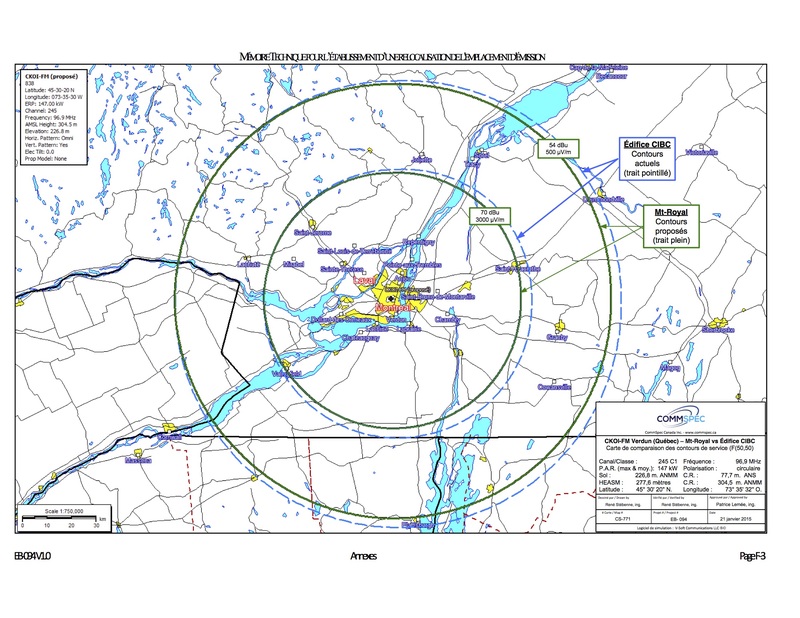 By the way, the decrease in coverage to the east, shown in the map above, comes from moving the transmitter west toward stations the CRTC don’t want CKOI interfering with. If this “short-spacing” were not involved, CKOI would still have to drop its power a bit, but not as much as it does with the new authorized power. Cogeco’s application does indeed call for a circularly-polarized antenna for CKOI. If this “short-spacing” were not involved, CKOI would still have to drop its power a bit, but not as much as it does with the new authorized power. Short spacing isn’t the issue here. ISED (not the CRTC) said it would approve the new transmitter setup provided it didn’t expand beyond what the station covered at 307kW. This setup is the maximum that CKOI can put out with an omnidirectional antenna without expanding its footprint to the west. Thanks! If I could edit my reply, I’d make a few changes. One is that I now see (from a different angle than I was looking before) that CKOI has vertical as well as horizontal elements on its current mast. I can’t find reference to those online, but I suppose it does have a vertical signal now. (Though not circular, as co modern antenna designs that favour neither plane.) I also see that one of the fifteen vertical elements is missing. Another is that my “short-spacing” point is the one you mention. The new signal has to fit in the circle of the old one. Since it’s moving off the center of the old circle, the new circle will be smaller. BTW, I’m currently on a month long trip through Canada, visiting from the U.S. One of the most interesting things for me here (about radio, at least) is the disappearance of AM signals. Here in Quebec (city), where I am now, all the local signals are gone. Hit SCAN in the daytime, and the radio stops at nothing. At night, of course, skywave signals come in. Nearly all are from the U.S., where AM is dying a slower death. AM is alive & well in the major centres; of which QC City isn’t one. Two provinces (NS & PEI) no longer have any AM signals. But their populations are sparse. Some of the Winterpeg stations have tremendous reach…. I know it is a rarity, and due to e-skip, but I have picked up CITI 92.1 in Montreal before.